The Avocent AutoView 2020 (AV2020-001) switching system easily upgrades to virtual media, includes multi-platform support, advanced cable management and a convenient on-screen display. 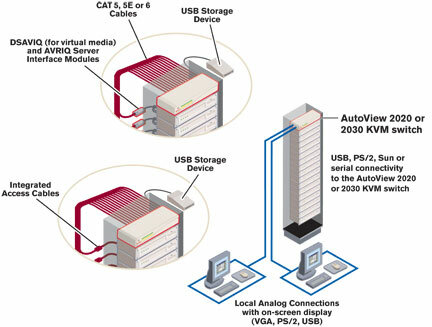 The Avocent AutoView 2020 (AV2020-001) dual user 16-port KVM switch includes local virtual media support, local USB peripheral support and connectivity to PS/2, USB, Sun and serial devices for small and midsize data centers. Using the on-screen display, you can easily configure your system and quickly select servers. The Avocent AutoView 2020 (AV2020-001) switch features flexible cabling options, giving you a choice of integrated access cables or server interface modules that let you customize cable lengths. Either cabling option automatically assigns and retains unique server names for each attached server, which simplifies your installation and makes re-configurations easy. Upgrade to virtual media capability and easily share a directly-connected USB storage device to all servers connected to a KVM switch. Server interface modules DSAVIQ-USB2 and DSAVIQ-USB2L required for virtual media support. Includes local USB keyboard and mouse support. Two local users gain simultaneous access to 16 PCs and network devices. Easily configure your system; name and select your servers from the convenient on-screen display (OSD). BIOS-level access ensures connection to your attached servers regardless of the health or type of operating system. A 1U rack mount design save spaces in your rack. Flash-upgrades firmware gives you fast and easy updates for appliances and server interface modules. Keep Alive power safeguard allows your attached servers to continue network functions in the event of power failure to the AutoView switch.